Exactly 10 months ago on this day, we took delivery of our Renault Duster AMT. It was a well thought of decision and after reviewing cars like TUV, EcoSport, Brezza, BRV and the Creta, we decided to book the Renault Duster AMT. Fast forward to today, it has been a good experience after completing around 22,000kms till now. We are travelers and have tried the Duster in highways, off roads, broken roads, and jungle trails. We’ve covered hill stations, valleys, flat roads, beaches, hairpin bends – any terrain that we could get. The Duster is called an SUV but it actually is a crossover. It operates and handles more like a sedan than an SUV. I switched from a small size Wagon R to the bigger sized Duster but felt no discomfort in handling the car in the city as well as highway stretches. Yes, the increased width and length took some getting used to but from the moment I stepped into the Duster, handling was a piece of cake. The steering is very fluid and operates effortlessly in all conditions. I have the habit of driving single-handedly during highway stretches and still, the car handles pretty well. There are some reviews that the handling is stiffer at lower speeds but I never experienced this; on the contrary, the Duster seems very nimble and agile even in bumper to bumper traffic. Before the delivery, I had asked for Bridgestone/Michelins but instead got the Apollo. I have never used this brand before and decided to give them a try. It hasn’t been a great experience though. I am not saying that the tires are bad but they are not suited for the terrains I travel to. They are not suited for bad roads or wet conditions and I have always felt them struggling for grip in the slightest amount of gravel or loose mud. Even the smallest stone can be felt and I am not sure if this is a tire issue or a suspension issue. I am just waiting to run these out and switch to better tires. One of the best features of the Duster and this is probably what sets it apart from the competition. What I really love about this car is the distance between the wheel arches and tires giving it a distinct SUV look and feel. Having a soft suspension is a boon when you are battling the potholes in Bangalore or taking the car out for some off-road in the Nilgiris. Ground clearance is the key highlight and my savior in some pretty rocky stretches I have covered. The AMT comes with a normal driving mode and an ECO mode which basically shifts gear at lower RPM’s resulting in increased mileage but lower power delivery. I have ALWAYS used the ECO mode except for off roads and found it very comfortable. The drop in power as compared to normal mode is not much and hardly noticeable in city driving. During high-speed overtakes, I have noticed a slight lag in power delivery and I generally stick to M mode in such situations. The highest mileage I have recorded was 22.5kmpl on a 350km trip from Bangalore to Chennai. I did use the Cruise Control a lot with speed setting on 85kmph. On a normal day, I get about 17-19 kmpl on the highways if I maintain speeds of around 90kmph or with the cruise control on and about 12-13kmpl in city conditions. All these figures are in ECO mode and Air Conditioning on. This is where Renault needs to make some improvements. I am not too fond of the overall looks and quality of the interiors. Plastic quality in certain places is of cheaper quality to the ones used in low-end cars in India. You touch the plastic panels near the infotainment system and they start squeaking. It is evident where Renault has cut costs and cut corners too. When you drive over a rough patch, you can hear the plastic parts vibrating which is an irritating distraction for some drivers. The seats are very comfortable and clad in decent quality materials. The AMT is almost the top end and Renault should have offered me Art Leather seats. The Automatic climate control delivers and the AC performance has been top-notch as of now. Apart from the plastic, my biggest feedback is the cabin noise. In traffic, it feels like I am traveling in an open-air vehicle as the doors and windows don’t have enough sound protection. I have asked the service center several times if they can give me an extra lining on the doors but according to them, it’s not recommended by Renault. The overall build quality is OK but I would have liked the body to be a bit sturdier than what it is currently. The exterior of the car feels flimsy and you can see how thin the body is once you press hard on the bonnet or the body panels. I have constantly faced this nagging issue of the bumpers coming off a little bit. There is a visible gap between the front/rear bumpers and the body panel. Even after complaining multiple times to Renault the issue hasn’t been rectified. The windows keep making a rattling sound, probably due to the glass hitting some metal parts inside the door panels. The Duster comes equipped with a new Media Nav infotainment system with an 18 cm touch screen. It included Sat Nav, multimedia functions and Bluetooth connectivity with smartphones (max 5). The system offers easy access to functions such as Radio, Multimedia, Maps and settings through the home screen. Navigation is a bit tricky for first-time users but you get used to it after spending some time on it. The Bluetooth tech enables drives to make and receive hands-free calls along with synching your phone’s phonebook. The inbuilt maps are very basic and not as good as Google Maps but are very handy in areas where you don’t have a mobile network. I had to spend a couple of hours reading the manuals as operating the Maps can be a very tricky affair. Having driven a manual all my life, switching to an automatic was a big move. Before I got the Duster, I test drove the TUV AMT as well and found it lacking on several fronts. The Duster, on the other hand, has the best AMT vehicle in the country in its category. The problem I faced with lags during gear shifts in the TUV is very minimal and hardly noticeable in the Duster. Sudden gear shifts while overtaking have been very soon provided you press the accelerator hard, which signals the chip to do the rest. The gearbox has performed well in all conditions all though I was not very happy with the performance in hairpin bends. I found the system getting into higher gears as soon as it hit 2000 RPM which might not always be the best gear to be in. But hey, it’s just a computer and not as smart as a human brain. In such conditions, I generally switch to the manual mode which gives me better revs and increased power delivery. Renault has also introduced the Hill Assist Feature which I got with the AMT. Essentially, HSA holds the car for about 2-3 seconds in its place when on an incline, giving the driver enough time to accelerate and move forward without rolling back. Very useful feature while driving in ghats or while parking on an incline. Overall my experience with the Duster has been a mixed bag of feelings. I love the handling, suspension, features but hate the build quality. Let us know what you think about this review. Leave your comments and we will get back to you soon! Here’s more about Renault India products. Tourist or Traveler! Which one are YOU? Very apt and realistic review. 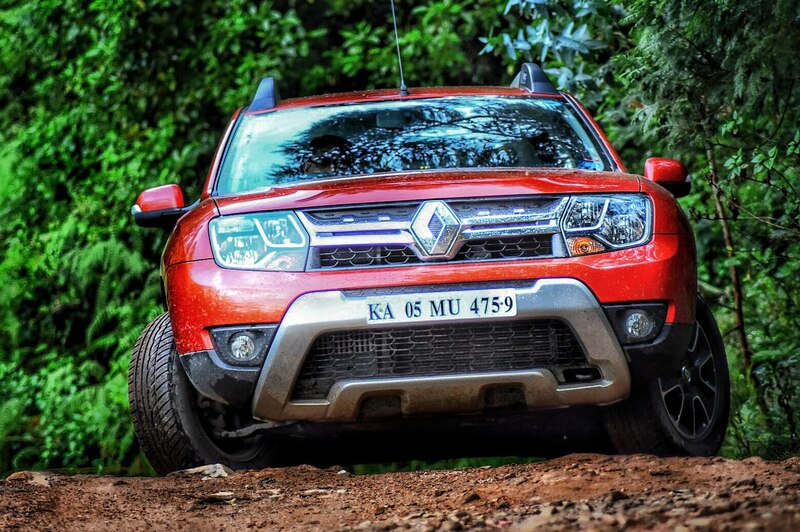 I think the real advantage of Duster is the wonderful suspension and ride quality which is coupled with AMT now. Can you tell me on how is the feeling at rear seat? Is it comfortable? I am thinking of shifting to Duster from Honda City VX CVT due to horiible suspension set up, which is a daily pain now. Thanks for the feedback Tirtha. Rear seats are very confortable for 3 people. Seats are great for long rides. I love the suspension and clearance and it’s help up well on off roads even with 5 in the car. Go for the Duster if u can live with the little nags and if u want a good car for bad roads/ off roads. Just one drawback of the rear seats is that they can’t be reclined. Detailed review….liked it very much. Very well written.. I share similar preferences in a car so have booked the rxz AMT variant. But I am little worried about the experience on hair pin bends and mountain inclines .. can you pen your experience on how you handle the hassle pin bends in the AMT ..
Santosh on hilly terrain I always use the manual mode. It gives better control on power delivery than the manual and does the job just fine. Still you can’t compare it with a manual transmission and I have learnt to drive according to its power delivery. It’s reliable. But if ur looking for a vehicle in this segment I would suggest you go for the Creta. Unless ur looking for a 4*4. Then go for the Duster. Feature wise Renault hang upgrades their vehicles in a long time.